Every minute spent planning saves 10 minutes on execution. That's what time-management experts like Brian Tracy say. For white papers, planning is even more critical. 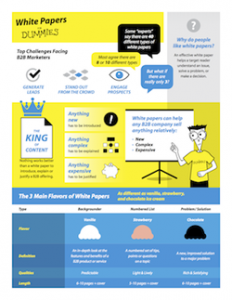 Without an effective plan, your white paper has a poor chance of attracting leads, building recognition, or generating a strong ROI. As a former marketing executive, now an award-winning copywriter, I've seen this too many times. That's why I start every white paper with a detailed plan. Planning is so powerful, I've made it a required first step for all my clients. Then I deliver a multi-page strategic plan that spells out these details, along with my best recommendations and my firm quote for completing your project. Discussing all this in advance—and getting a clear consensus from all your stakeholders—helps engineer your white paper for success. For only $975 my planning service gives you a rock-solid foundation for your next white paper. Plus, you dramatically lower the risk of embarrassment from releasing a document that reflects poorly on your firm. And thanks to my years of experience, you avoid the common pitfalls and follow the best practices. With your plan, I'll include my firm quote to create your finished white paper. After that, the choice is yours. You can hire me, hire a trusted writer who knows your industry, or use your in-house resources to create your white paper. Whatever your choice, your investment in planning will actually save you $$$ and guarantee better results. Take the next step... today! To find out more about me, explore this site. You can see my experience or scan through my client list showing dozens of satisfied clients from Silicon Valley to Switzerland. Then look at my samples and testimonials.